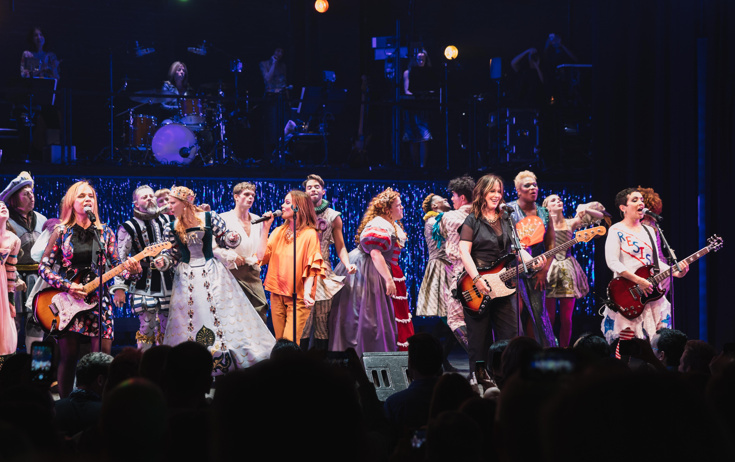 The audience at the July 12 show of Head Over Heels got a special surprise when The Go-Go's came out after the cast's curtain call to perform some of their hit songs. Belinda Carlisle, Jane Wiedlin, Charlotte Caffey and Kathy Valentine (drummer Gina Schock was absent) rocked the house with some of their hits. The music of The Go-Go's, which is one of the the most successful all-female groups, serves as the score for the Elizabethan-set Head Over Heels. With a book by Jeff Whitty, adaptation by James Magruder, choreography by Spencer Liff and direction by Michael Mayer, the new musical is a love story with a beat straight out of the 1980s with such songs as "Our Lips Are Sealed," "Mad About You" and "Heaven Is a Place on Earth." Check out the pic above to feel like you're at a Go-Go's concert, and watch the clip below to get your head bopping to the bea. Oh, and be sure to see Head Over Heels, which is currently in previews at the Hudson Theatre and officially opens on June 23!